one of the mechanisms through which business regulation can impact employment directly is the simplification of business start-up regulations. 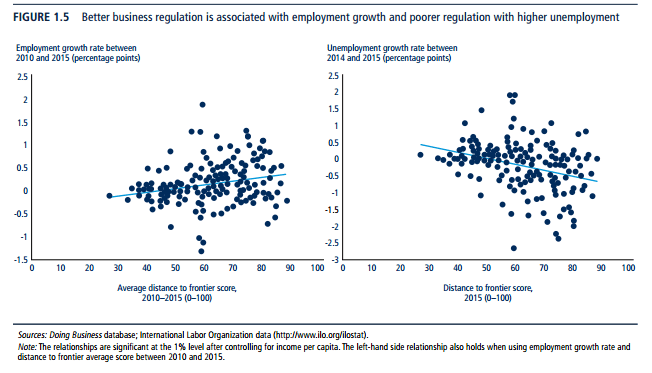 Across economies there is a significant positive association between employment growth and the distance to frontier score (figure 1.5).While this result shows an association, and cannot be interpreted in a causal fashion, it is reassuring to see that economies with better business regulation, as measured by Doing Business, also tend to be the economies that are creating more job opportunities. When it comes to unemployment, the expected opposite result is evident. Economies with less streamlined business regulation are those with higher levels of unemployment on average. In fact, a one-point improvement in the distance to frontier score is associated with a 0.02 percentage point decline in unemployment growth rate. Was the China Shock Actually a Boom? Our empirical results show important job gains due to US export expansion. We find that although imports from China reduce jobs, the global export expansion of US products creates a considerable number of jobs. Based on the industry-level estimation, our results show that on balance over the entire 1991-2007 or 1991-2011 periods, job gains due to changes in US global exports largely offset job losses due to China’s imports, resulting in about 300,000 to 400,000 job losses in net. Estimation at the commuting zone level generate even bigger job creation effects: in net, global export expansion substantially offsets the job losses due to imports from China, resulting in about 200,000 net job losses over the period 1991-2007, and a roughly balanced net effect if we extend the analysis to 1991-2011. In Feenstra and Sasahara (2017), we quantify the employment effect of US imports and exports using a global input-output analysis. Following the technique of Los et al. (2015), we use the world input-output table from WIOD and examine the employment effects of US total exports and imports from China and from all countries during the period 1995-2011. Admittedly, this approach only indicates the impact of trade on labour demand, without taking into account the (regional) supply of labour in general equilibrium. We find that the growth in US exports created demand for 2 million manufacturing jobs, 500,000 resource-sector jobs, and a remarkable 4.1 million jobs in services, totalling 6.6 million. The positive job creation effect of exports in the manufacturing sector, 2 million, is quantitatively similar to the result in Feenstra et al. (2017), in which 1.9 million jobs were created by US exports from the instrumental-variable regression approach. On the import side, our analysis shows that manufacturing imports from China reduced demand for US jobs by 1.8-2.0 million, which is similar to the result in Autor et al. (2016), who finds a decline of 2.0 million jobs due to imports from China. One advantage of the input-output approach is that it is easy to extend the analysis to other sectors such as services and natural resources. Our results show that, when focusing on the manufacturing sector and the natural resource sector, the net effect of overall trade with all countries in all sectors is slightly negative: 80,000 reduction in demand for jobs in manufacturing, and a 250,000 job reduction in the natural resource sector during 1995-2011. However, when looking at the service sector, we find a substantial net job gain, with a 1.03 million increase in the demand for jobs due to overall trade with all countries. This is large enough to compensate for the net job losses in the manufacturing and natural resource sectors. After taking all of these into account, the net effect of overall trade with all countries led to a net increase in labour demand of 700,000 jobs. 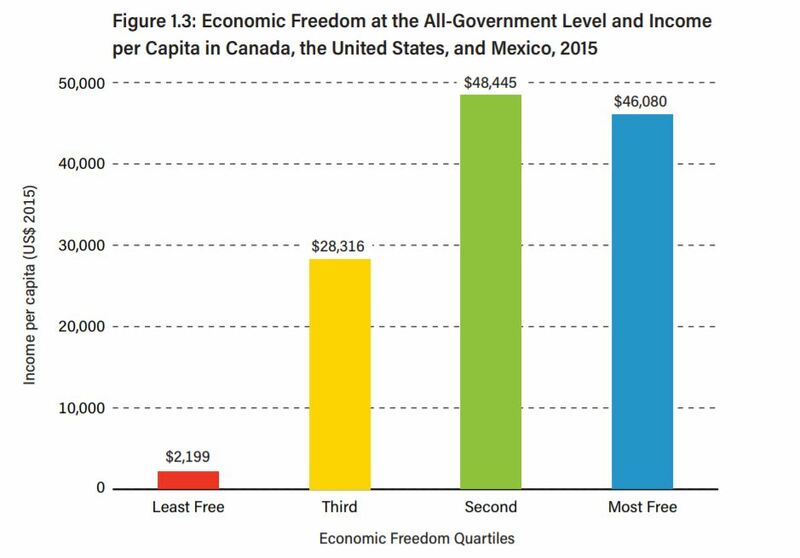 The Fraser Institute–who publishes the oft-cited Economic Freedom of the World report–published their latest Economic Freedom of North America report toward the end of December. This report looks at states within Canada, the United States, and Mexico. 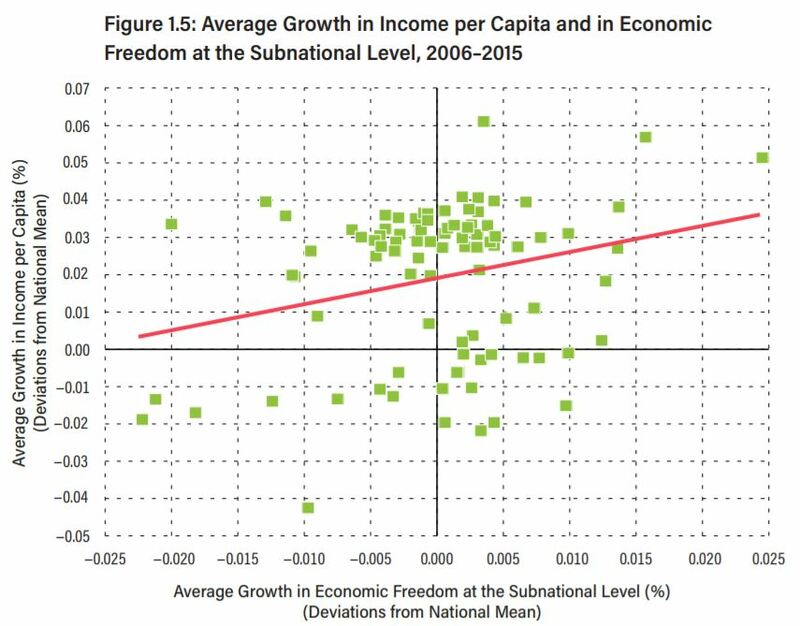 Once again, there is a link between economic freedom and economic well-being. Personal freedom is relatively low in Texas, but it should rise with the Obergefell decision, setting aside Texas’s super-DOMA…Criminal justice policies are generally aggressive—though Texas has emerged as a leading voice in the national reform movement. Even controlling for crime rates, the incarceration rate is far above the national average and has not improved since 2000. Drug arrest rates have fallen over time but are still above average for the user base. Nondrug victimless crime arrest rates have also fallen over time and are now below the national average. Asset forfeiture is mostly unreformed, and law enforcement frequently participates in equitable sharing. Cannabis laws are harsh. A single offense not involving minors can carry a life sentence. Even cultivating a tiny amount carries a mandatory minimum of six months. In 2013–14, the state banned the mostly harmless psychedelic Salvia divinorum. Travel freedom is low. The state takes a fingerprint for driver’s licenses and does not regulate automated license plate readers at all. It has little legal gambling. Private school choice programs are nonexistent, but at least private schools and homeschools are basically unregulated. Tobacco freedom is moderate, as smoking bans have not gone as far as in other states. Gun rights are moderately above average and should improve a bit in the next edition with the new open-carry law. Alcohol freedom is above average, with taxes low. Texas has virtually no campaign finance regulations. Above is a pic of Chinese artist Chen Zhen’s 1999 sculpture Precipitous Parturition, which currently hangs in the Guggenheim Museum in New York City as part of its Art and China after 1989: Theater of the World exhibit. 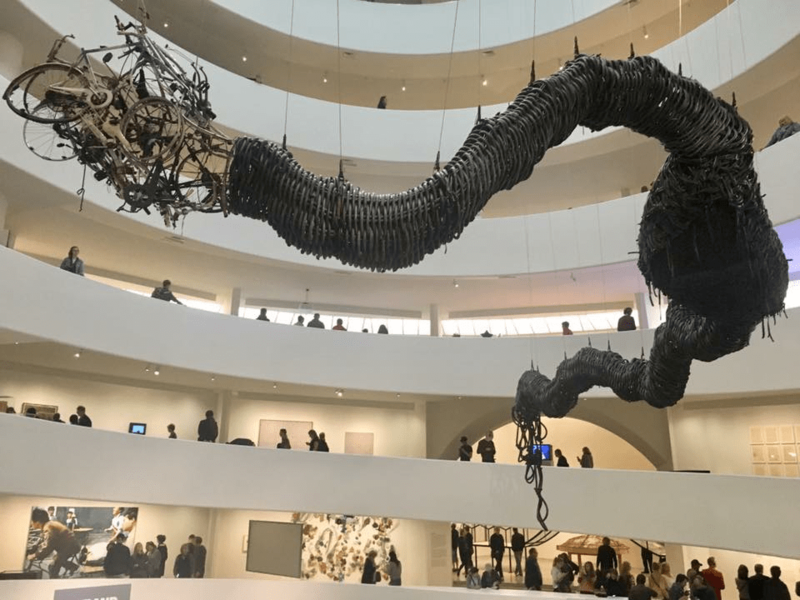 Zhen “used found materials, weaving black rubber bicycle inner tubes, plastic toy cars, and bicycle parts into a 25-meter-long writhing dragon form. Inspired by a slogan proclaiming: “In 2000, 100 million Chinese people will possess their own cars. Welcome China to participate in the competition of our car industry!,” the work comments on China’s transition from a nation of bicycles into a nation of cars.” If you look at the middle of the sculpture, you’ll see that the dragon is giving birth to an abundance of toy cars, capturing the essence of China’s emerging, globalized economy and culture. Let me start out by saying that maybe six weeks ago I had a visit from an old student. Forty years ago, he was a young Taiwanese. In the meantime, he has built a very successful business in Taiwan, and for the last seven years or so has been in Shanghai, where he is now head of a very large joint-venture firm. And I asked him, “What has happened? What’s the most important thing that has happened in China the last three to five years?” And he thought for about five seconds and then said, “That we now consider owning an automobile a necessity and not a luxury.” That is what globalization means. It is not an economic event; it’s a psychological phenomenon. It means that all of the developed West’s values–its mindset and expectations and aspirations–are seen as the norm…It is a fundamental change in expectations and values. While Zhen may have bemoaned this modern China, the country’s heightened participation in the global economy nonetheless yielded enormous benefits for the Chinese people. Worries over increasing technology, urbanization, and globalization–and the cultural ramifications of it–are too often misplaced. Personally, I find it troubling that people pine over a lost era of poverty and misery. So instead of interpreting the toy cars in Zhen’s piece as a kind of spreading viral infection, perhaps we should see it as a rebirth; as something new and beautiful. Because that’s the only way I can think to describe millions of people being lifted out of extreme poverty. Individualism is rising across the world, according to a forthcoming study in Psychological Science by a team of Canadian and American psychologists who evaluated 51 years of data on individualistic practices and values across 77 countries. There is, however, one big exception to this salutary trend: China. Researchers focused on shifts in measures like the cross-cultural Individualism-Collectivism scale in the countries they evaluated. Individualism promotes a view of self-direction and autonomy, whereas collectivism fosters conformity and adherence to social obligations. Individualistic cultures prioritize independence and uniqueness whereas collectivist cultures emphasize family and fitting in. To get at how cultures have moved along the individualism-collectivism spectrum the researchers used data focusing on changes in individualistic cultural practices and also World Values Survey responses that track shifts in cultural values. The relevant cultural practices included changes in household size, percentage of people living alone, older adults living alone, and divorce rates. The researchers also analyzed how values changed with regard to the importance of friends versus family; teaching children independence or obedience; and preferences for self-expression such as arguing that free speech should be protected in their countries. In our recent work (Dreher et al. 2017) we provide a detailed analysis of how the number of foreigners living in a country has affected the number of terrorist attacks made by foreigners on citizens of their host countries. According to the raw data, in OECD countries between 1980 and 2010, for every million foreigners in the population, 0.8 terror attacks are committed per year, per country (there were 662 transnational attacks). While it is obvious that the number of attacks increases with the number of people living in a country (after all, with no foreigners in a country, no foreigners would commit any attacks), on average these numbers amount to about one attack by foreigners per year and host country, and 1.3 people die from these attacks in the average country and year. Transnational terror is dwarfed in absolute numbers by the number of attacks made by the domestic population. In the 20 OECD countries that our sample covers, there were 2,740 attacks arising from the domestic population. In relative terms though, the picture is different – there were fewer than 0.18 terrorist attacks for every one million locally born citizens in a typical country and year. Overall, while the probability that foreigners are involved in an attack on the domestic population was much higher than the risk that citizens were involved in attacks on their own country, the risk associated with each additional foreigner was tiny. In our statistical analysis, we investigate whether, and to what extent, an increase in the foreign population of the average OECD country would increase the risk of terrorist attacks from foreigners in a host country. We identify exogenous variation in the number of foreigners living in an OECD country using changes in migration resulting from natural disasters. These changes affected host countries differently, according to the specifics of each host- and origin-country pair. Using data for 20 OECD host countries, and 187 countries of origin between 1980 and 2010, we find that the number of terror attacks increased with the number of foreigners living in a host country. This scale effect that relates larger numbers of foreigners to more attacks does not imply, however, that foreigners are more likely to become terrorists than the domestic population. When we calculate the effect of a larger local population on the frequency of terror attacks by locals, the effect is of a comparable size. We conclude that, in this period, migrants were not more likely to become terrorists than the locals of the country in which they were living. 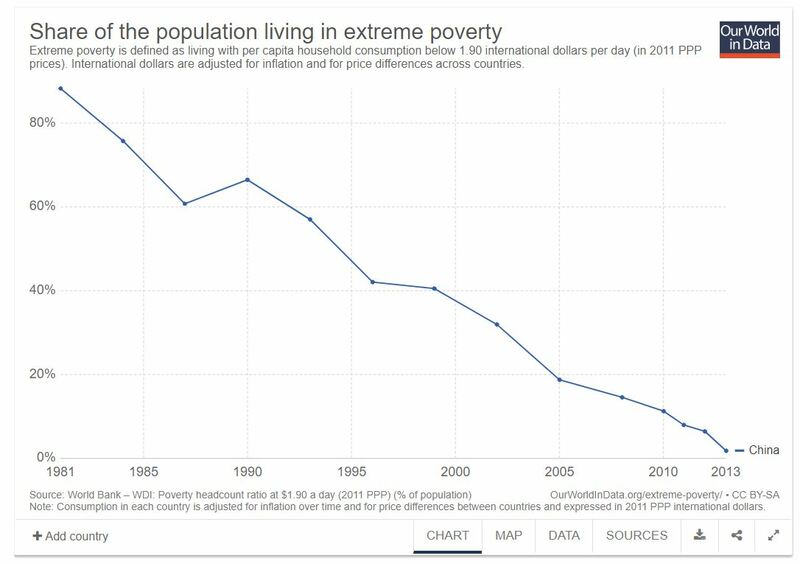 To put these results in perspective, consider the expected effect of a decrease in the domestic population of 0.0002% (which is the average decrease in the domestic population of the 20 OECD countries we studied in 2015, according to the OECD). According to our model, this would have reduced the number of terrorist attacks by 0.00025 per country and year. The increase in the stock of foreigners living in these countries was 3.6% in the same year. According to our estimates, this would have created 0.04 additional attacks. We might argue that this hardly justifies a ban on foreigners as a group. We find little evidence that terror had been systematically imported from countries with large Muslim populations. The exceptions were Algeria and Iran, where we found a statistically higher risk of being involved in terrorist attacks against the local population, compared to the average effect of foreigners from non-Muslim countries. In this light, the phrases ‘Muslim terror’ or ‘Islamist terror’ does not seem accurate or useful. Only 6% of the terrorist attacks in the US between 1980 and 2005 period were carried out by Muslims, and less than 2% of all attacks in Europe had a religious motivation between 2009 and 2013 (Alnatour 2017). Contrary to the expectations of many politicians and pundits, introducing strict laws that regulate the integration and rights of migrants does not seem to have been effective in preventing terror attacks from foreign-born residents. We rather find that repressing migrants already living in the country with these laws has alienated a substantial share of this population, which increases the risk of terror. Stricter laws on immigration thus have the potential to increase the risk of terror, at least immediately following the ban. …Our results illustrate an important trade-off. While stricter immigration laws could reduce the inflow of (violent) foreigners and thus potentially the number of future terrorist attacks, the restrictions would also increase the probability that those foreigners already living in the country become more violent. Immigration bans, like those recently introduced in the US, would arguably increase the short-term risk of attacks, before potentially reducing risk when the number of foreigners in the population has decreased. As a native of Sweden, I must admit this makes me Feel the Bern a bit. Sanders is right: America would benefit hugely from modeling her economic and social policies after her Scandinavian sisters. But Sanders should be careful what he wishes for. When he asks for “trade policies that work for the working families of our nation and not just the CEOs of large, multi-national corporations,” Social Democrats in Sweden would take this to mean trade liberalization—which would have the benefit of exposing monopolist fat cats to competition—not the protectionism that Sanders favors. In fact, when President Barack Obama visited Sweden in 2013, the three big Swedish trade unions sent him a letter requesting a meeting. Their agenda: a discussion of “how to promote free trade.” The chairman of the largest Social Democratic trade union scolded the American president for his insufficient commitment to the free flow of goods. 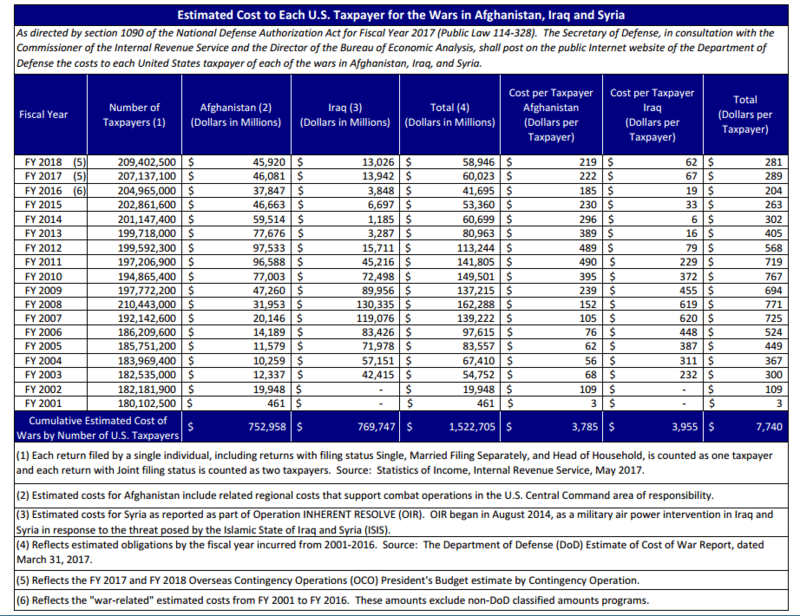 One reason is that we compensate for them with a more open economy than others. In the summary Fraser Institute rankings, Sweden and Denmark are more economically free than the United States when it comes to legal structure and property rights, sound money, free trade, business regulation, and credit market regulations. We don’t have the multitude of occupational licensing laws that block competition in the United States. We also pay for the welfare state in a fairly brutal way, but one that doesn’t hurt production as much: by squeezing the poor and the middle class. Unlike the rich, poor and middle-class people don’t flee or dodge when they’re taxed aggressively. The Social Democrats knew all along that they couldn’t fund such a generous government by taking from the rich and the businesses—there are too few of them, and the economy depends on them too much. So Sweden and Denmark take in lots of revenue via highly regressive value-added taxes at a normal rate of 25 percent of sales—the only tax where the rich and poor pay exactly the same amount in kronor. On the other hand, the corporate tax is just 22 and 23.5 percent respectively, compared to the U.S. rate of 35 percent. In fact, rich people in Sweden enjoy several economic advantages not offered to their lower-class counterparts. Sweden always admitted very generous tax deductions for capital costs. Labor regulations are tailored to benefit big companies. To attract highly educated specialists from abroad, Sweden now has a beneficial “expert tax” for them, which shields 25 percent of their wages from taxation for a three-year period. “Sure, it is unfair, but we have no better solution,” the Social Democratic minister of finance said in 2000, when he implemented special tax exemptions for individuals and families who owned a large share of a listed company. Unlike Sanders, Scandinavian socialists have concluded that you can have a big government or you can make the rich pay for it all, but you can’t do both. Two Scandinavian economists, Andreas Bergh and Christian Bjørnskov, have documented that a high degree of trust is an old legacy, and that descendants of those who emigrated from Scandinavia 100 years before the welfare state are also more trusting. Their conclusion is that trust in others and social cohesion creates the welfare state rather than the other way around, since it is more tempting to give power to politicians and money to strangers if you believe that they are decent people who would never cheat the system. Scandinavians have always frowned on those who take money they are not entitled to. Sweden is, after all, the country where the leading candidate for prime minister in 1995 had to resign because it was revealed that she had used her official credit card to pay for some small private expenses, even though she always, every month, paid the credit card debt herself. When asked, “Under what circumstances is one justified in accepting government benefits to which one is not entitled?” in 1991 and 1998, the Nordics led the world in saying “never.” (Only Malta says it is more upstanding, and a brief canvass of Maltese of my acquaintance suggests that they are rather likely to have lied on the survey.) Oh, and the United States is 16th, lower on the list than even the Italians. How did Sweden become rich? What explains Sweden’s high level of income equality? What were the causes of Sweden’s problems from 1970 to 1995? How is it possible that Sweden, since the crisis of the early 1990s, is growing faster than most EU countries despite its high taxes and generous welfare state? In many aspects, Sweden is not very different from other countries. The accelerating economic growth in Sweden around 1870 was most likely largely a result of liberalizations and well-functioning capitalist institutions. In this respect, there is no Swedish exceptionalism. When it comes to equality, the most important conclusion is that most of the decrease in income inequality in Sweden occurred before the expansion of the welfare state. A number of seemingly unrelated reforms, such as land reforms, school reforms and the occurrence of unions and centralized wage bargaining, are likely explanations. Interestingly, at least parts of gender equality in Sweden seem to be an unintended consequence of the need to increase labor supply by using women in the workforce. Thus, when it comes to the roots of prosperity and equality, the lessons from Sweden are not very different compared to the lessons from mainstream institutional economics: Well-functioning capitalist institutions, especially property rights and a non-corrupt state sector, promotes prosperity. Primary schooling, risk sharing social insurance schemes and labor unions contribute to a more equal distribution of income (pg. 21). combination of unsuccessful macro-economic policies and a very generous welfare state…During the period of lagging behind, excessive state interventionism hampered structural adjustment and economic development in general. The economy was much less capitalist, rules were unstable, policy unpredictable, and work incentives were weakened by the design of taxes and benefits. This leads to the conclusion that to successfully combine a large welfare state with economic growth, macroeconomic factors are crucial and a high degree of economic openness may actually foster policies that promote competitiveness. Analyzing the fact that Sweden was ranked the second most competitive country in the world according to the Global Competitiveness Index 2010–2011 (just slightly behind Switzerland). Eklund et al. (2011) emphasize the role of market deregulations, inflation control and stricter budget rules – but also some lowering of taxes and benefit levels. 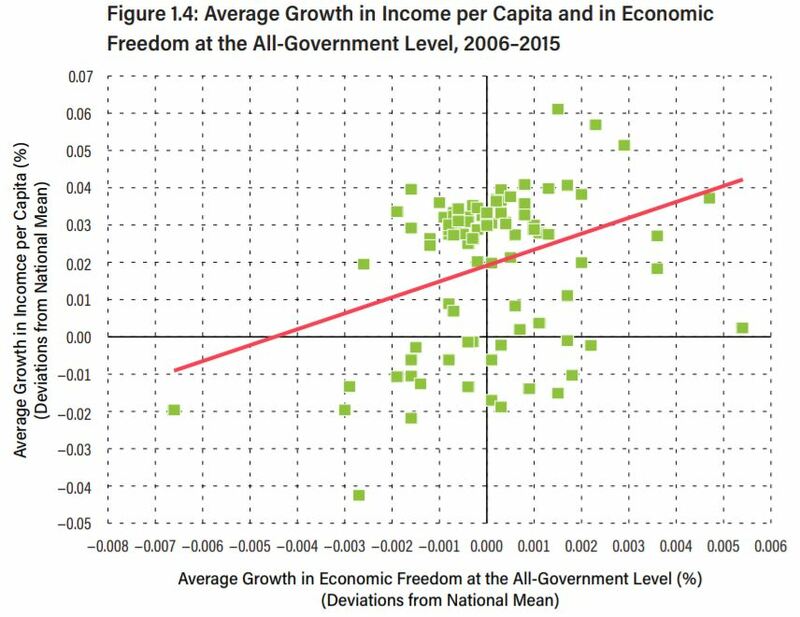 The upshot is that the policy implications from the case of Sweden are hard to classify along a simple right-left scale: the welfare state seems to survive because it coexists with high levels of economic freedom and well-functioning capitalist institutions (pg. 22). So, be like Sweden. But be like it in the right ways. There’s a piece I’ve been meaning to write for months about the end of Pax Americana. This is not the post, but it is a prelude. Traveling in Turkey last week, American Secretary of State Rex Tillerson said that “longer-term status of President [Bashar] Assad will be decided by the Syrian people.” This may not sound shocking, but it’s a thinly-veiled euphemism (similar to ones employed by long-time Assad ally Vladimir Putin) for a shift in American policy away from overthrowing the Assad regime and towards allowing Assad to finish suppressing the Syrian rebels and retain power. Within a few days of that, Assad’s forces apparently launched a chemical weapon attack that killed at least 69 civilians, including women and children. It’s not hard to draw a line from the first event to the second. Although Obama infamously and catastrophically failed to back up his “red line” threat, global disapproval is the key feature that has kept the Assad regime from repeating the chemical weapons attacks of 2013. In signalling the shift in American policy, Tillerson effectively handed the Assad regime a blank check. They cashed it. What’s fascinating to me is the reaction by American isolationists to this fairly mundane and predictable series of events. If the implacable foe of a murderous, WMD-deploying dictator suddenly decides that they’re placcable after all, it shouldn’t shock us when that murderous, WMD-deploying dictator uses his suddenly longer leash to go out and use those WMDs to murder his enemies. That is what murderous, WMD-deploying dictators do. And so this is what American non-intervention looks like. But the isolationists–led by Ron Paul–can’t face that reality because they have been telling Americans for literally decades that the real source of all the violence in the Middle East is American meddling. If only America would back off, they say, the level of violence would diminish. In order to preserve that narrative, we suddenly get outlandish conspiracy theories about how the attack was a false flag operation at the behest of American neocons. Yes, according to Ron Paul (and a lot of his followers), it is more plausible that John McCain, the CIA, and Syrian rebels are in a conspiracy to frame Assad for using chemical weapons than that Assad himself used chemical weapons. This is not the post where I present my full case for continued American participation on the global stage. That will come soon, I hope. This is the post where I remind everyone that extremism is almost always a symptom of absolutism. Absolutism is a natural reaction to a tragic world in which tradeoffs, ambiguity, and complexity are unavoidable. Humans hate all of these things at a visceral level. We would much rather live in a simple, black-and-white world with easy answers to all of our toughest problems. When I was a little kid, I was viscerally upset about the Chinese crackdown of the Tiananmen Square protests. I fantasized about the US sending F-15s to blow up the bad guys and save the student protesters. Real life doesn’t work that way, and it seems that some of the loudest voices calling for us to “do something” in Syria never learned that lesson. As though it was self-evident that anything we did would have a net-positive impact. That’s one kind of extremism. The other is the kind that says if the US just packs up and goes home, vicious dictators won’t take advantage of that power vacuum to drop chemical weapons on unarmed families. As though it was self-evident that anything we did would have a net-negative impact. So let me be clear: this isn’t an argument for more or for less intervention in Syria. I don’t know the best strategy for us to take there. This is simply an argument against oversimplification and the vilification that inevitably follows. Why does oversimplification lead to vilification? Because if the world is simple and the answers are easy, then you have to come up with an explanation for why all our problems still exist. The only plausible answer is that there are really bad people who just want everyone to suffer and somehow they are in control. That is why belief in a fundamentally simplistic world leads directly to belief in astonishingly ornate conspiracy theories and cartoonish supervillains. It’s just the cost of sustaining the illusion that the world is orderly, predictable, and comprehensible. No matter what we do in Syria, there will be costs, they will be high, and they will be borne by the most vulnerable. I hope we can try to debate with a little more good faith and sobriety what–if anything–we can do as a nation. It might not seem like the emotionally appropriate response to tragedy, but it’s the only responsible one.